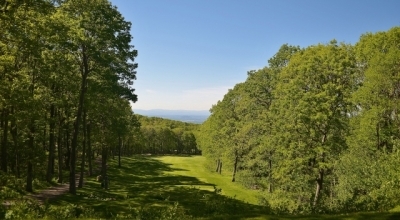 WINTERGREEN, VA -- Wintergreen Resort's original golf course is an Ellis Maples design that opened in 1976, known then and today as Devil's Knob. It's a curious title, in that hell is supposedly hot and excruciatingly painful -- and neither of those adjectives truthfully depicts what's offered up in the mountains of central Virginia. Wintergreen Resort is about an hour's drive south and west of Charlottesville, and even the drive up the mountain is nothing short of angelic. Cool temperatures and stunning mountain views accompany you on the journey up to the resort -- and once there, you'll find excellent accommodations and facilities to welcome you to heaven. The view from the tee of the dogleg right, par four 1st hole. Come prepared to hit it straight at Devil's Knob. No doubt, the devil hasn't been seen around these parts for an eternity. If anything, Devil's Knob may get its name from the difficult nature of the layout. 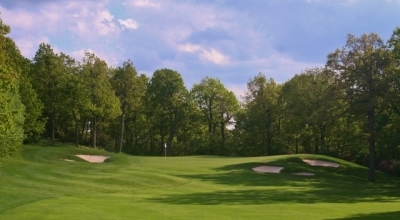 Number one greets you with a slight dogleg right, and the first thing you'll notice is the landing area is guarded by dense forest on each side. Some might call it tight. The accuracy challenge won't let up until you're done, either. Devil's Knob's Head Golf Professional, Philip Licata, admits the layout is difficult, yet it's also the type of course where you probably won't need to bring your driver: "If you play Devil's Knob from the white tees -- where 95% of the players play it -- you really only need about 170 yards off the tee on most holes. For that reason, it's a great course for seniors and ladies, where they can hit long irons from the tee box and still score well." There aren't many safe places to hit driver at Devil's Knob, but you can let fly on the par four 16th hole. 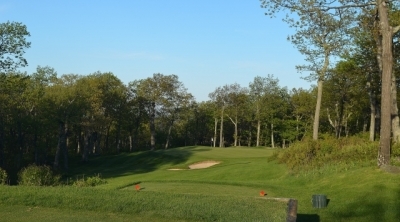 From the back tees, Devil's Knob measures 6,712 yards, and plays even shorter due to its lofty elevation (lighter air) and firm playing conditions. The sloped fairways often provide generous rolls if you manage to hit the ball where it's supposed to be -- but doing that is much easier said than done. The layout's high altitude (almost four thousand feet, the highest course in Virginia) and location (on top of a ridge) can lead to devilishly difficult conditions. Breezy a good portion of the time, the smart player weighs wind direction and severity on every shot. Even then it's tough -- because once your ball's above the treetops, it's anything goes for the flight. Lucifer probably laughs heartily while watching players gauging the prevailing wind direction, only to curse when he changes it in mid-flight. The view from Devil's Knob's 12th green -- a devilishly difficult short par four. The greens at Devil's Knob also deserve special note. Not only are they in great shape, they roll fast and true. Maples obviously set out to challenge you in the putting game with some significant undulation and tiered greens -- but also with your iron play in reaching the putting surfaces. It's essential to leave the ball below the hole, and any shot long is trouble -- if you're over the green, forget it. If you're above the hole, good luck finding the brake lever on your golf ball. Trees border both sides of nearly all of Devil's Knob's holes. Here, the par three 4th hole. Licata adds, "After you've played the course a few times, it's a good strategy to go for the same areas off the tee to set up your approach shots. It's better to be short of the putting surfaces, because it'll be a much easier pitch up the slope than down -- and there are run-up areas in front of almost every green to give you the option of that shot, too." 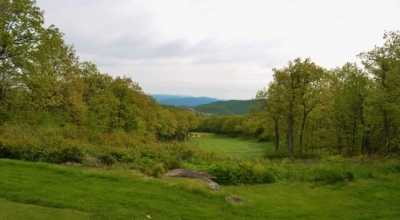 Local Wintergreen members and resort guests have enjoyed the course for nearly four decades, yet the difficult nature of the terrain and the passage of time mandated some changes. Devil's Knob's irrigation system had a hard time keeping the playing surfaces consistent, making an already challenging course that much more difficult. For that reason Wintergreen spent over a million dollars ($1.25 million) in the early 2000's to improve the course. Licata explains: "The driving force behind the changes here at Devil's Knob was the need to replace our old irrigation system. We'd really been limited in our ability to water certain areas of the course, which was making things a bit uneven in terms of conditions. In doing so, we went to a double row system, so we're now able to water more effectively and efficiently." That's not all. As long as you're addressing some needs, you might as well fix up the other areas that might have deteriorated under heavy play over the course of decades. Here too, the Wintergreen folks spared no expense. Sunflowers divide the par five 10th hole and the 11th tee. Just one of the many beautiful sights you'll see at Devil's Knob. Respected Golf Architect John LaFoy was brought in to redo the bunkers and address a few of the course's playability issues. 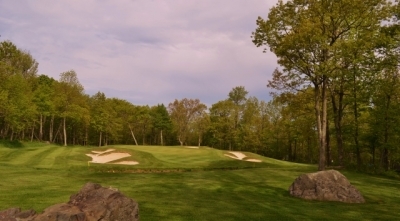 Again, Licata expounds: "We'd noticed that the bunkers on the Devil's Knob course needed some work, so we asked John LaFoy to come in, redesign them and make them a little bit more intriguing looking, with more fingers and character. They actually got a little deeper and smaller in the process." LaFoy explains his role in bringing Devil's Knob up-to-date: "Over the years, the bunkers had lost their edges and the last three to five feet of the bunkers (toward the putting surfaces) had gotten very steep and just about impossible to hold sand. I reshaped all of the bunkers and bowled them, with flashing sand, but more of a continuous slope rather than an abrupt slope as the bunker approached the putting surface. I also rolled the capes or added capes down into the bunkers to give them a little more character." And as you'd guess, they have some real nice new sand. It's never a pleasure to be in the sand on a golf course, but at least the playable bunker sand helps ensure you're not in there more than a few seconds. But as Licata alluded to above, the most arduous work involved the installation of the new irrigation system. LaFoy said it was no small task: "A large part of the project was installing a new irrigation system, but thank goodness that was not part of my design work - talk about rocks! The bunkers were bad enough with many loads of small to medium sized rocks having to be removed." The par three 15th hole plays considerably different from each tee box. LaFoy added that the rock problem was so severe that the original contractor that was doing both his project and the irrigation threw up his hands after nine holes and negotiated his way out of doing the second nine holes. A large irrigation/utility contractor that was used to working in rock came on board and finished it. There was some work in softening the slopes in the greens as well. 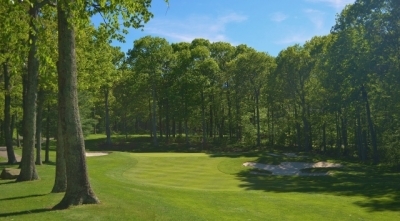 But LaFoy's most noticeable playability improvement also rankled some of Devil's Knob's long-time players: "I also recommended removing a large Spruce tree from the middle of a fairway (the par five 5th hole) which I am sure made that particular hole much more playable. I got a little flack from a few members, but I think I can now say that it is not missed!" It's true -- that enormous Colorado blue spruce was quite a hindrance to playing the hole... it was right in the middle of the fairway. With it gone, the hole plays much shorter and probably offers Devil's Knob's best birdie opportunity. LaFoy's work had some other effects: "The new bunkers on the course kind of gave all the green complexes a little fresher look. It was almost like having a new course, from the visual standpoint," Licata added. Bunkers perfectly frame the green on the par four 13th hole. Again, that's not all. Licata said their experience over the years demonstrated that they could use another set of forward tees on many of the holes. "With all the digging and trenching we were doing to put the irrigation system in, we created a lot of extra soil. We'd been wanting for some time to put in some more forward tees for resort guests in different spots, so that provided the perfect opportunity to do that." One of those "new" forward tee boxes is on the fifteenth hole, widely considered Devil's Knob's most scenic par three. Prior to the new addition, however, the hole either played at 185 yards from the back box, or 60 yards closer for the white tees. Licata said that was too big of a discrepancy, so a new box was added in front of the regular back tee, so white tee golfers no longer have to hit a knock-down wedge to avoid going over the green on this hole -- they'll have a 150-165 yard try instead. All in all, a significant improvement. On a clear day, the view from the 3rd tee is simply spectacular. And the best part about the 'new' Devil's Knob -- it's got all the charm that it's always had, and for those returning to play it again after many years, they'll benefit from the changes, yet probably won't notice a drastic difference. Out on the course, favorites included the third hole, a 520-yard par four (from the back tees) that'll give you all that is Devil's Knob -- an excellent example of how distance, elevation and wind direction combine to play havoc with your golfing common sense. The tee shot plays severely downhill to a dogleg right. Even at that distance, take a club less to avoid rolling through the fairway long. Keep it in the short grass on this course, or you'll struggle to reach the green in regulation on the par fours and fives. Another unique aspect at Devil's Knob is its hole sequencing. 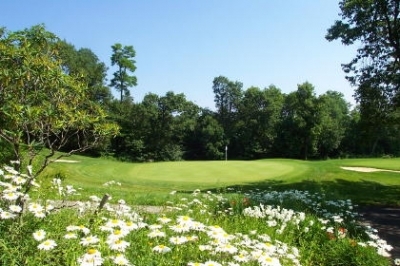 The course plays to a par 70, but the front nine features two par fives and three par threes. The back is a more standard one par five, two par three configuration (par 35 each side). The par fours are a good mixture of doglegs and straight on challenges. Exposed rock is everywhere at Devil's Knob. Here, the par three 17th hole. But even the straightforward holes usually have something distinctive to them, such as the twelfth hole -- which has a sharp sloping fairway to the right. Even a well-struck straight ball here might roll into the rough (or out-of-bounds). Better try and get some draw on the tee shot if you want to stay in the short cut. Two other holes on the back deserve honorable mention. The elevated tee shot on the sixteenth presents a spectacular mountain view. Measuring 417 yards from the back, it's one of the few opportunities where driver can be hit comfortably, and you may be able to record a 300 yarder if you strike it well -- because of the steep slope and fairway roll. Finally, the seventeenth is a picturesque par 3 -- again, from an elevated tee box. Players must contend with the wind direction here also, and there's a pond in front that won't really come into play for anything but a mishit. Bunkers protect the left and right sides of the green. Not a huge challenge, but very pleasant to look at. Coming in on the eighteenth, there's a veranda that overlooks the final green, where patrons can give a nice round of applause to putts true on their mark. Somehow, it's fitting that there should be some folks to give you a nice hand upon finishing the course. After all, you've challenged the devil and won. And you'll feel as if you did, too. 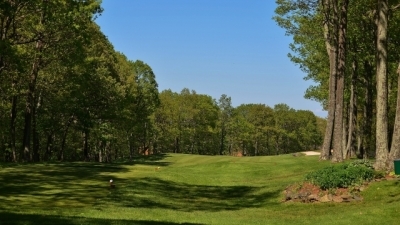 Click here to read a review of Wintergreen's Stoney Creek Golf Course. Click here to read about the Wintergreen Golf Academy. Click here for an overview of Wintergreen Resort. Seasonal - several good packages available in conjunction with a resort stay. Consult the website for dates and information. Note: Devil's Knob closes for the winter season. 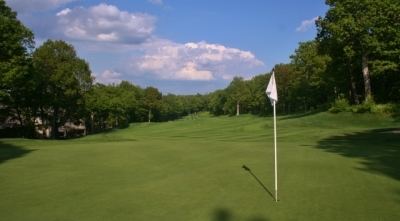 Golf is available at Wintergreen year-round at Stoney Creek, weather and conditions permitting.